Top seeded player Gozal Ainitdinova of Kazakhstan emerged the singles champion when she coasted to a comfortable 2-0 win against second seeded Pranjala Yadlapalli of India in the final played at the SLTA tennis courts in Greenpath, Colombo yesterday morning. Nineteen year old Gozal who is a world ranked player and who has won ITF tournaments in the recent past was taken to the wire in the first set but then settled down to win the second with ease to clinch the title. She did not participate in the Week 1 and 2 tournaments and her experience saw her ending the tournament with success. Meanwhile Pranjala having played second fiddle in the singles event made amends later in the day when partnered by Rutuja Bhosale clinched the doubles title defeating another Indian pair Natasha Palha and Rishika Sunkara who were the favourites to lift the title due to the fact that they were seeded second. Riya Bhatia of India and YeXin Ma of China emerged champions in the Week 1 and 2 tournaments, Bhatia lost to YeXin in the first round of the Week 3 tournament while YeXin Ma was ousted in the semi final by Aldila Sutjiadi of Indonesia in the same tournament. 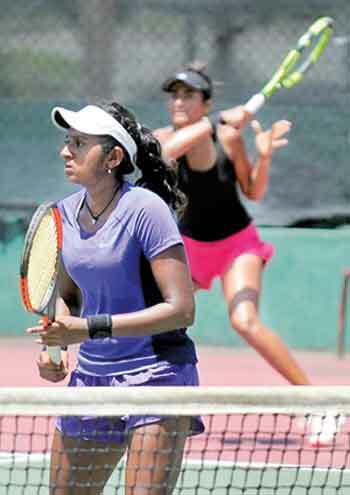 The Astoria Women’s Futures tournament conducted by the Sri Lanka Tennis Association with the blessings of the ITF began with the Week 1 tournament on October 2 and a cash award of $15,000 each was on offer for all the three tournaments.